High-quality P-51 Mustang prints are now available from Mustang! 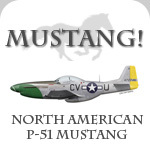 These very detailled and accurate prints are printed on heavyweight matt photo paper and make a perfect present for Mustang enthusiasts, pilots, mechanics or relatives. To learn more about the prints, including the available sizes and prices, click here.